Cutloose Climbing: Captain Graffiti 2nd Ascent! 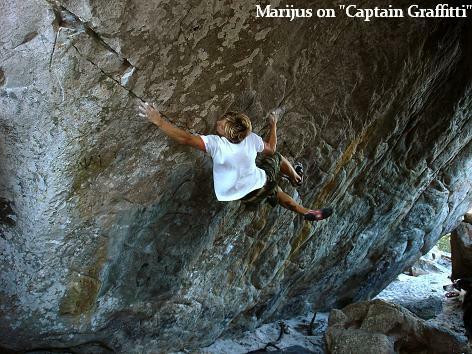 Marijus Smigelskis has made the second ascent of "Captain Graffiti" 8A at Echo Valley in Topside after 12 days of efforts (the longest he has ever spent on a problem). Although he could do all but one of the moves after a few sessions, the problem's crux, a long move to a small 2-finger slot (pictured below). It took him countless tries to stick the deadpoint when coming from the start and finally send the problem.